The problem of finding best routes in road networks can be solved by applying Dijkstra’s shortest paths algorithm. Unfortunately, road networks deriving from real-world applications are huge yielding unsustainable times to compute shortest paths. For this reason, great research efforts have been done to accelerate Dijkstra’s algorithm on road networks. These efforts have led to the development of a number of speed-up techniques, as for example Arc-Flags, whose aim is to compute additional data in a preprocessing phase in order to accelerate the shortest paths queries in an on-line phase. The main drawback of most of these techniques is that they do not work well in dynamic scenarios. In this paper we propose a new algorithm to update the Arc-Flags of a graph subject to edge weight decrease operations. 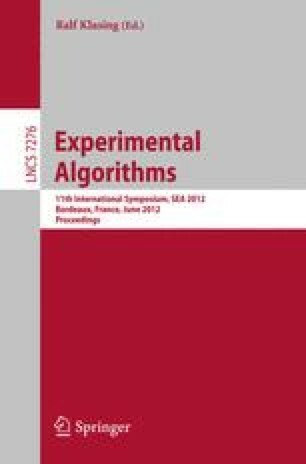 To check the practical performances of the new algorithm we experimentally analyze it, along with a previously known algorithm for edge weight increase operations, on real-world road networks subject to fully dynamic sequences of operations. Our experiments show a significant speed-up in the updating phase of the Arc-Flags, at the cost of a small space and time overhead in the preprocessing phase.